I recently discovered yet another site on which it is possible to waste your precious time while feeling like you’re learning something. The site is called Dynastree and allows you to map the distribution of surnames in the US, Canada, and a few European countries. As you can imagine, it’s easy to get carried away searching the maps for your surname, your spouse’s, your mother’s maiden name, your grandmothers’ maiden names, et cetera, et cetera. But as I was whiling away the minutes, I noticed a few trends which demand some analysis. The Mice first came to the US in the mid-19th century and settled primarily in Minnesota and Wisconsin. As you can see, they are still mostly concentrated in that same area, although there are also significant concentrations in a few magnetic states in the Northeast, as well as California and Florida. The Aments came to the US at about the same time as the Mice, settled in the same general areas, and to this day, have a similar distribution across the US. 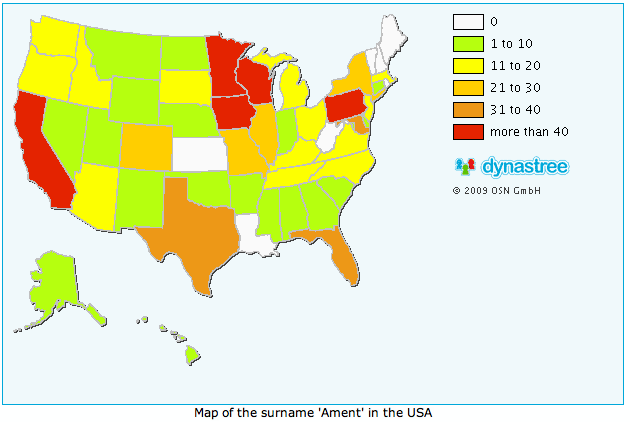 Both the Maus and Ament clans have only been in the US for a little over 150 years, which perhaps explains why neither has spread too significantly beyond their initial settlements in the US. As you can see, the Hathaways are rather ubiquitous in the US. They can be found in every state and there are large concentrations of them in very disparate states — from Massachusetts to Indiana to Washington state. This seems intuitive: the Hathaways have been in the US since the 17th century and thus have had more time to spread out across the country. The logical answer would seem to be “Because the Hathaways have been here longer.” BUT, here is where things get interesting. If the primary limiting factor on a family name’s spread is time, we should expect that in their respective European homelands, each of these names should be fairly widespread, since they all have had hundreds of years to move around. The Mäuse came from the western edge of Germany in what is now North Rhine-Westphalia, and that is still where they are concentrated. They can be found in other areas of western Germany , but for the most part, they are spread very thinly. You can probably guess, from looking at this map, where the Aments came from. They came from the southwest of Germany, in what is now Baden-Württemberg. With the exception of the neighbouring state of Hesse, and a few small clusters around the urban centres of Berlin and Munich, Baden-Württemberg is still one of the only places in Germany that the Aments can be found. The Hathaways originated in South Wales and were established in the Severnside and the west of England by the time that some of them left for the US. They are still most concentrated in Gloucestershire and nearby counties. The Hathaways have managed to spread somewhat in the south of England, although curiously, there are some counties with absolutely no Hathaways (such as Leicestershire and Avon) that are adjacent to counties with significant concentrations of Hathaways. So here is the question that all these brightly-coloured maps raises: Why was it so much easier for families to spread across the US in only a few generations than in their respective European homelands over an even longer period of time? I have a few possible explanations for this disparity in geographic mobility. Hopefully some of my readers will have more well-researched answers. 1. Ease of displacing neighbours. When the Hathaways and other early European immigrants arrived in the Americas, the land was very sparsely populated, and if they wanted more land, they had to annex it from Native Americans, who had little means of resistance. By the time my German ancestors arrived in the US, the country was much more densely populated, and the neighbours they would have needed to displace to acquire more land were now other Europeans who had better means of resistance than the Native Americans. Ditto in Europe. 2. “New World” effect. Perhaps there is something to that notion that the New World offered an opportunity for European immigrants to start afresh. Local rivalries and prejudices that might have prevented families from moving to nearby areas in England or Germany were either absent or less formidable in the Americas. 3. Time Required for Dynasty formation. Local dynasties can form that elevate a family to a place of regional prominence and therefore give members of that family a strong disincentive to stray too far from their dynasty’s sphere of influence. This would explain why the Cabots, one of the first families of the “Boston Brahmin” are still most concentrated in Massachusetts. But dynasties take time to form, and dynastic families in Europe had a several hundred-year head start on would-be dynasties in the US. Note that this idea runs counter to the argument that the longer a family has been in the US, the more widespread they would be today.